effort to improve the law. 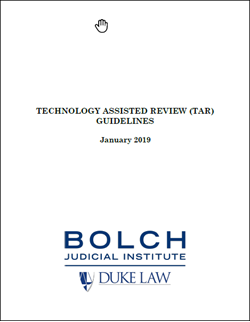 technology assisted review (TAR) is an early iteration of AI for the legal profession. Consilio’s Xavier Diokno, Deborah Ketchmark, Philip Richards, Justin Scranton and Carolyn Young contributed to these guidelines which originally appeared on EDRM.net in January 2019.